A cataract is a clouding of the lens in the eye that affects vision. Most cataracts are related to aging. Cataracts are very common in older people. By age 80, more than half of all population either have a cataract or have had cataract surgery. A cataract can occur in either or both eyes. It cannot spread from one eye to the other. Cataracts generally develop gradually and although symptoms vary there are some symptoms that most people experience. Most people will eventually develop a cataract in both eyes, though one eye may be affected before the other. Lights can seem to glare, or you may find that the headlights of a car dazzle you more than they used to. Slight change in your color vision – things may appear more yellow than before. This often happens if one eye develops a cataract first and colors look different when you compare one eye with the other. The only effective treatment for cataracts is surgery to remove your cloudy lens and replace it with an artificial lens implant. This is done by an ophthalmologist (eye specialist) at a hospital. Lasers aren’t used to remove cataracts and there is no evidence to suggest that changing your diet, taking vitamins or using eye drops can cure cataracts. The operation to remove your cataracts can be performed at any stage of their development. There is no longer a reason to wait until your cataract is “ripe” before removing it. However, because any surgery involves some risk, it is usually worth waiting until there is some change in your vision before removing the cataract. Cataract surgery usually takes about 30 to 40 minutes and most people go home from hospital a few hours later. It is usually done with a local anesthetic, which means you will be awake during the operation but you won’t feel any pain. To remove the cataract, the ophthalmologist needs to remove the natural lens in your eye and replace it with a plastic lens implant. The most common way to remove cataracts is called phacoemulsification. This technique uses high frequency sound energy to break up your natural lens with the cataract. 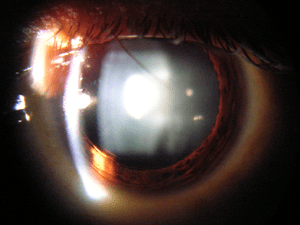 Cataract operations are generally very successful, with a low risk of serious complications. The most common risk is developing a condition called posterior capsule opacification (PCO), which causes cloudy vision to return. If this happens, you may need to have laser eye surgery to correct it. Eye diseases can be prevented through food supplements and also making sure that your eye gets a good rest after eye intensive tasks like working on a computer for long periods of time. ‘..,.